Deeply enmeshed political milieus that hover around the Middle East often share space with action figures, cheap packaging, and radio hits. 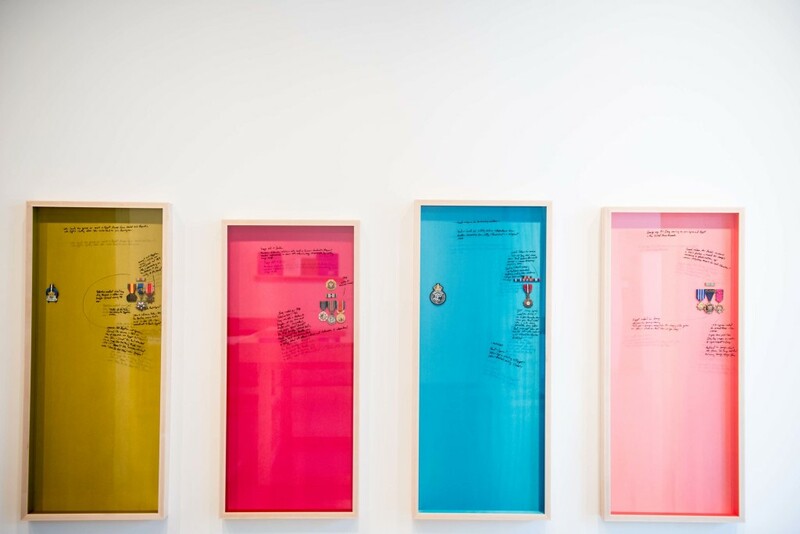 Across these disparate histories and cultural productions, Chicago-based artist Michael Rakowitz has deployed clever substitutions and subtle comparisons in his work, to either shift contextual meanings, or simply to demonstrate the ways contextual meanings can shift on their own. In his survey exhibition, Backstroke of the West, on view at the Museum of Contemporary Art Chicago, Rakowitz reconfigures an array of objects and cultural reference points, from ancient monuments such as the Babylonian Ishtar Gate to Saddam Hussein’s dinnerware and Western Pop mythologies. Curator Omar Kholeif’s statement characterizes his practice as dealing with “translation, restitution, and re-constitution,” terms that overlap in spirit with the field of Information Theory. Michael Rakowitz, The Breakup: John (Egypt), Ringo (Jordan), Paul (Palestine), George (Iraq), 2012-14. Installation view at Lombard Freid Gallery, New York. Image courtesy the artist and Lombard Freid Gallery. Although commonly associated with communication technology, Information Theory concerns itself with a much broader question of how form of any kind is identified and transferred. “Information” itself is defined by Marcia Bates as “the pattern of organization of matter and energy,” and by Hans Christian Von Baeyer as “the communication of relationships.” More narrowly, there is the question of what types of information can be identified and what modes of interaction they exhibit. Bates lays out a comprehensive glossary in Fundamental Forms of Information, ranging from somewhat obvious examples as recorded (“communicatory or memorial information preserved in a durable medium”), to more esoteric categories such as embedded, enacted, embodied, and trace/residue. Those of us steeped in the vagaries of even the most rigorous art theory will be forgiven for finding the dry precision of these categories somewhat refreshing: recorded information must have communicatory intent, otherwise it is likely a form of embedded information, which is any object or other durable result of action: “the spider makes its web, the bird builds a nest, the human being makes tools, utensils, and other artifacts.” Embodied information is always the result of some encoded information—the blueprints that dictate the form of a house, the genotype that conditions what range of phenotypic features an organism can display, or a cake recipe that encodes the embodied outcome in a set of instructions that produces it. Information is by definition “meaningless”, but can act as a kind of scaffolding upon which meaning is built and transferred. Two implications of this set of definitions immediately pull aspects of Rakowitz’s work into relief. First, various layers of information often exist within one object of reference, simultaneously. Second, information can flow and adapt in various ways—shifting between these different states of being. In his project What dust will rise? 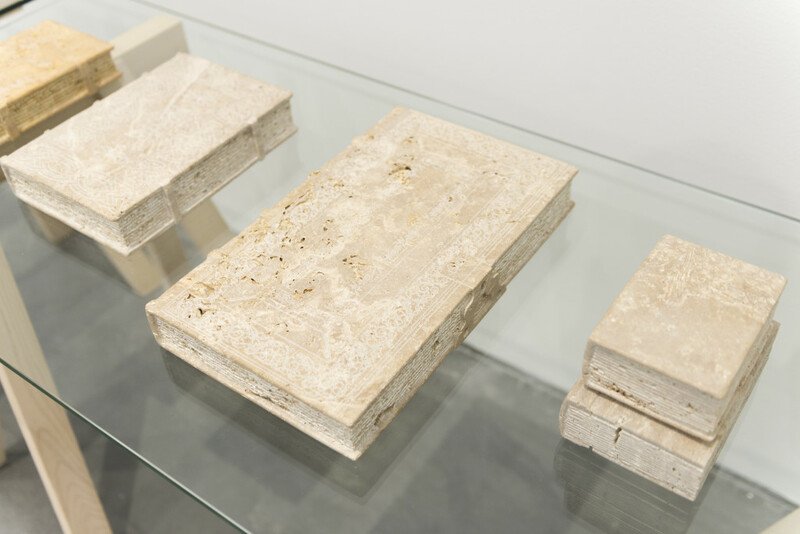 (2012), Rakowitz reconstitutes German books destroyed by British bombers in WW2 by commissioning master stone carvers from Afghanistan and Italy, using stone quarried from the region where the Taliban destroyed sixth century statues of Buddha. Here Bates’ observation that recorded information must have communicatory intent becomes poignantly tragic, for it is precisely this communicatory function that remains lost as the books are re-formed. Instead, the physical form of the original German book makers is transcoded by another sculptural production, substituting the original embedded information for another, one that also gestures toward the lost carving (embodied information) of the destroyed statues. Simultaneously, the lost embedded information of the physical books is used as encoded information for the creation of new sculptures. If there are metaphors at play here between these lost artifacts or the violent politics that destroyed them, they emerge out of the shifts between these modes. Installation view, Michael Rakowitz: Backstroke of the West, MCA Chicago September 16, 2017—March 4, 2018 What Dust Will Rise?, 2012 Photo: Nathan Keay, © MCA Chicago. Information Theorist Susantha Goonatilake has conceived of three “information flow lineages,” which demonstrate different ways that form is repeated or transferred: genetic, neural-cultural, and “exosomatic.” The latter is defined broadly as memory that is stored externally to the human body, and appears in the exhibition in numerous ways: hand-written narratives on vellum where Rakowitz sifts through various obscure histories and the surprising synchronicities within them; the mechanical drawing-tracings with which he illustrates these narratives; song recordings playing in different areas; pop culture archives displaying old magazine covers, comic books and posters. It is in this information flow lineage where Rakowitz observes and amplifies all kinds of slippages and metamorphoses. A gesture of crossed lightsabers from a Star Wars poster is repeated by a victory arch commissioned by Saddam Hussein, and again by American soldiers posing as imperial tourists in front it after Hussein’s toppling. A cover of Deep Purple’s hit “Smoke on the Water” plays throughout the gallery, in a recording where the drummer happens to be an Iraqi archaeologist dedicated to recovering lost patrimony of his home country. Audio clips of American soldiers narrating traumatic stories of their time in Iraq are superimposed over a stop motion animation video of an action figure seeking to liberate Mesopotamian votive figures from a museum display case (the toy soldier itself was chosen due a bizarre story in which it had been used by insurgents in a hoax hostage video). In all of these cases, Rakowitz displays a virtuosic propensity for connecting dots that resemble the most kaleidoscopic storylines of a Thomas Pynchon novel. While they would all be examples of Goonitalakes’s exosomatic lineage, they also illustrate his concept of the neural-cultural lineage, whereby the experiences, desires and actions of an individual all take place within an inherited flow of cultural matter, even as that flow is in turn shaped by the individual. The neural and the cultural intertwined in a kind of feedback loop that generates repetitions, but also mutations and mistranslations. Information Theory also concerns itself with questions of signal versus noise in pathways of communication. While noise is often understood as an obstacle to a signal carrying a message, the phenomenon of stochastic resonance indicates cases where the presence of white noise (that is, randomness) actually helps amplify the signal. Given that Rakowitz often deals with objects and histories that are lost and proposes ways to reconstitute them imperfectly, stochastic resonance seems a fitting way to understand the material substitutions he makes. In The invisible enemy should not exist (2007-ongoing) he remakes archeological artifacts stolen from the National Museum of Iraq, not with stone that best resembles the original artifact, rather, with cheap and lightweight cardboard packaging and newspaper. While the forms (embodied information) of the objects are painstakingly reproduced, the materials (embedded information) add more “noise,” not less, by inserting randomness with non authentic matter. The Greek word stohkos means “aim” or “guess,” and there is something almost optimistic about Rakowitz’s suggestion that the way to redeem these lost objects is to embrace the noisy, playful, and non sequitur guessing game that one necessarily must engage in when reconstructing what was destroyed. 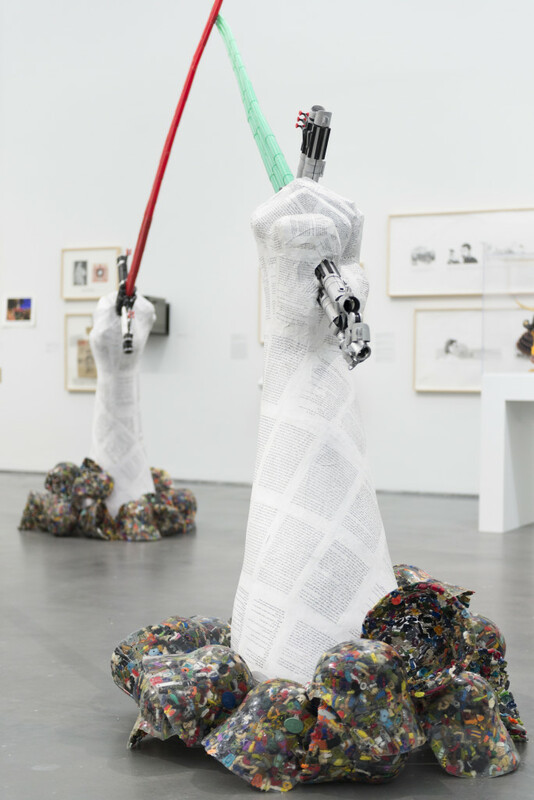 Installation view, Michael Rakowitz: Backstroke of the West, MCA Chicago September 16, 2017—March 4, 2018 The worst condition is to pass under a sword which is not one’s own, 2009 Photo: Nathan Keay, © MCA Chicago. Rakowitz deals with the Middle East peace process most directly in The Breakup (2010), where he uses the history of the formation and dissolution of The Beatles as a proxy for understanding the various actors of the the Palestine-Israel conflict and its nexus of power struggle in the region. Rakowitz’s handwriting annotates various archival objects and images from the two break ups in four wall mounted glass cases (one for each Beatle), transparently struggling with the best way to overlay the two stories and tease out some kind of comparison. On the “Paul McCartney” case, he writes “Paul=Syria for partnership with John,” only to cross it out and correct it with “Paul=Israel, b/c publicly declares independence from Beatles, transitions from ally (Palestine?) to belligerent state.” The efforts to link these figures seems less based on factual assertions as to their actual historical dynamics, and more of an appropriation of the mythologies and public narratives from each, as a kind of ready-made lore ripe for nearly miraculous synchronicities and coincidences (various timelines and actions line up to an uncanny extent). Rakowitz’s arrangement of these histories is not reliant on metaphors in the conventional semiotic sense—instead, he triangulates the patterns and relationships within each, and how they are communicated. In other words, he approaches them as bodies of information. Bates’ most ambiguous category of information is trace or residue, which points to the reality of all information slowly bending toward entropy. Languages die, stone inscriptions erode away, JPGs become corrupted, paths become overgrown with weeds, iron structures rust away. But it is in this trend toward entropy that new information sprouts out or reconfigures itself. Rakowitz’s extrapolations of history alternate between the tragedy of information dissolving into residue and the redemptive potential within it. Michael Rakowitz: Backstroke of the West runs at the MCA Chicago until March 4, 2018. Martins is a Chicago based visual artist, curator, and educator. He is the executive director of Comfort Station, and a lecturer at the School of the Art Institute of Chicago and North Park University. February 1, 2018 | Filed under Art Seen: Chicago and tagged with Information Theory, Jordan Martins, MCA Chicago, Michael Rakowitz.